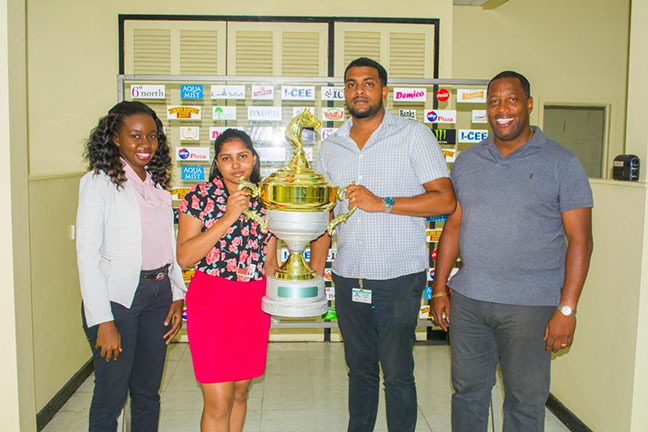 Nasrudeen Mohamed Jr. (second right) alongside Mortimer Stewart of Banks DIH Limited (right) poses with the championship trophy during the presentation earlier in the week. For horse racing fans the season has gotten more exciting as a potential Triple Crown candidate could be emerging. Today at the Rising Sun Turf Club, the all-important second jewel in the Triple Crown will determine if there will be a Triple Crown contender in the first event of its kind in Guyana’s history. The anticipation is at fever pitch as the gates of the well prepared West Coast Berbice track will once again be open to local thoroughbred racing at its finest. Action in the packed nine-race card gets underway at 12:30hrs and in excess of $8M in cash and prizes will be up for grabs. The C and Lower seven-furlong race will headline the card’s activities with the nation’s premier trotter, Vera’s Finally, stable mate, Don’t Over Look (first leg winner), TNT, Storm Bird and others making up the field. The handlers of Vera’s Finally, the two-time winner of the prestigious Guyana Cup, will be gunning for a winning start to her 2019 campaign after her success in 2017 and last year. Boss of the JJRS, Nasrudeen Mohamed Jr. told Stabroek Sport recently that the feature should be a scorcher and he anticipates the fastest local seven-furlong event will be run tomorrow since Vera’s Finally is “looking like a winner in training”.